You've found the “U.S. 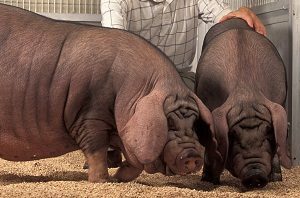 Meishan Pig Breeders” page here at Hobby Farm Wisdom! If this is the first time you have visited our site: Welcome! The Meishan is a breed of domestic pig native to Southern China that is considered a sub-group of the Taihu pigs. Meishan is a small pig known for its large, drooping ears and wrinkled skin and face due to excessive fat. Their slow growth rate and excessive fat has prevented them from becoming popular in the United States. Despite this, they are one of the most prolific breeds of pig in the world. Their popularity is due to the fact they reach puberty by 3 months of age and can successfully birth and raise litters up to 16 piglets. Meishan pigs are resistant to disease and are excellent foragers. They produce a very flavorful meat.